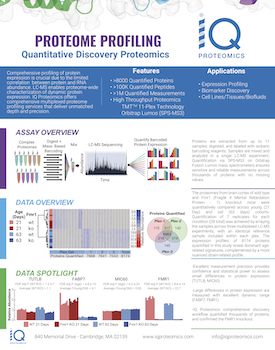 The documents below highlight several examples of proteomic applications offered by IQ Proteomics. This overview provides a brief summary of IQ Proteomics' technology and services and how we utilize these workflows to provide comprehensive and actionable datasets. Comprehensive profiling of protein expression is crucial due to the limited correlation between protein and RNA abundance. LC-MS enables proteome-wide characterization of dynamic protein expression. 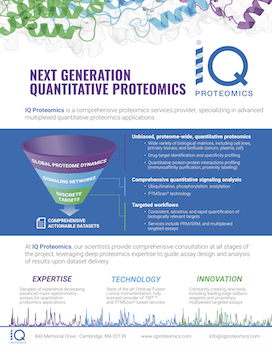 IQ Proteomics offers comprehensive multiplexed proteome profiling services that deliver unmatched depth and precision. Phosphorylation is a key regulator of many cellular processes, and aberrant signaling in phosphorylation pathways is a hallmark of many diseases. Targeted enrichment of phosphorylation events, combined with multiplexed LC-MS, enables the quantification of thousands of unique phosphosites. 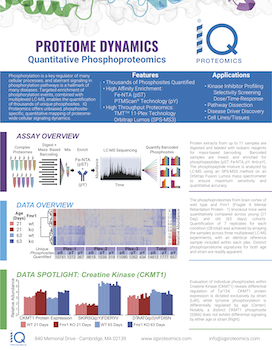 IQ Proteomics offers unbiased, phosphosite- specific, quantitative mapping of proteome- wide cellular signaling dynamics. Protein ubiquitination is an essential regulatory modification that controls protein turnover. LC-MS is a powerful tool for specific identification of ubiquitination sites via the diGly remnant produced following trypsinolysis of ubiquitinated lysines. 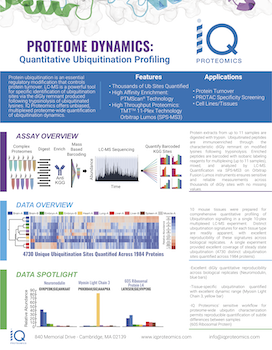 IQ Proteomics offers unbiased, multiplexed proteome-wide quantification of ubiquitination dynamics. Covalent small molecule inhibitors offer unique advantages over traditional drugs, including increased potency and prolonged efficacy. Notable irreversible inhibitors include Afatinib (EGFR), Ibrutinib (BtK), Neratinib (ErbB), and ARS-853 (RASK G12C). 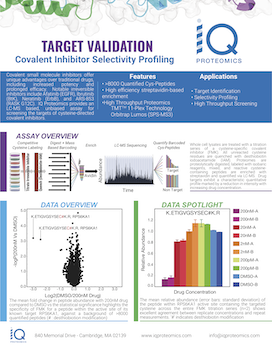 IQ Proteomics provides an LC-MS based, unbiased assay for screening the targets of cysteine-directed covalent inhibitors.